WordPress tags are very important and are similar to the categories, only they are usually not there for navigation reasons. They’re more for sorting posts based on topics and identifying your content for search engines as well as visitors looking for specific keyword phrases. Tags are usually more specific than their category counterparts. Categories (see The Benefits of the WordPress Category) are broader, but tags dig down deeper to tell you specifically what’s inside a specific blog post. After you add a new post, on the right side, you’ll see a section that says Post Tags. You’ll be able to type in keywords and phrases and separate them with commas. Or maybe, if you’ve had the blog for awhile, just click “Choose from the most used tags” and choose from the common tag options. If you change your mind and wish to delete a tag, just click the gray X beside the tag. 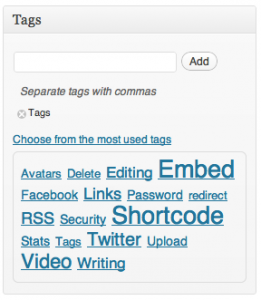 WordPress highly suggests around 5 to 10 tags be added to each blog post. Not having any isn’t great for your search engine optimization. Having too many only confuses your reader. You can keep on top of your tags from the main dashboard, too. Click on Posts and then Post Tags. You can add tags, delete or edit them from there. A tag cloud shows you which tags you use most on your website and can usually be found in the sidebar. If you see a tag you want to edit in the tag cloud, click on it and it will let you edit the words and the URL for that tag, too. Tags and categories are both important to your website’s visibility and navigation. Don’t exclude one for the other – make use of them in tandem to provide your blog the very best SEO boost possible. This entry was posted in Advice, Beginners, Blog, SEO and tagged Advice, SEO, website, wordpress, WordPress Tags. Bookmark the permalink.